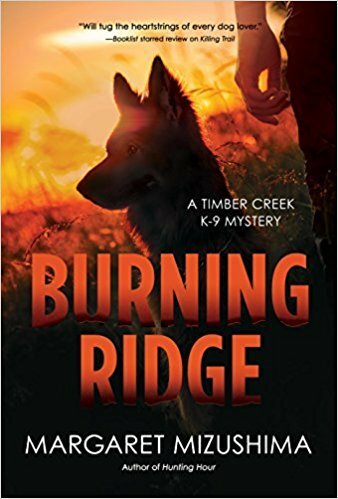 "Her past becomes clear, but not without a price to pay..."
Margaret Mizushima has done it again with her latest Timber Creek K-9 Mystery, BURNING RIDGE! I love reading this series and the characters that bring it to life. The main character, Mattie Cobb, shows strength and at times lets her guard down and reveals the real pain she carries around. This is the side she tries to hide away from those that really love and care about her. She shows her nurturing side as well as her tough side throughout this storyline. This makes her character believable and real to the reader. Another reason why I love this series! Mattie Cobb and her K-9, Robo, are targets of a ruthless individual who wants answers that they think Mattie can answer. One man is already found dead at Colorado's Redstone Ridge and Mattie is closer to the dead man than she knows. More skeletons of three other victims are found. Is there a connection? And how is Mattie tied to it all? Time is running out for answers leaving Mattie's love interest, and local vet, Cole Walker, working with the local authorities to find Mattie before it is too late and to save Robo at the same time. I love that in this book of the series you get more background of Mattie that answers questions about her character in some of the past books. Watching this story develop with such loving and caring characters makes me more excited about what Mizushima has to come in the future ones. BURNING RIDGE by Margaret Mizushima is a must read from a great series. Even if you have not read the ones before, you will enjoy this one to the end. On a rugged Colorado mountain ridge, Mattie Cobb and her police dog partner Robo make a grisly discovery―and become the targets of a ruthless killer. Colorado�s Redstone Ridge is a place of extraordinary beauty, but this rugged mountain wilderness harbors a horrifying secret. When a charred body is discovered in a shallow grave on the ridge, officer Mattie Cobb and her K-9 partner Robo are called in to spearhead the investigation. But this is no ordinary crime―and it soon becomes clear that Mattie has a close personal connection to the dead man. Joined by local veterinarian Cole Walker, the pair scours the mountaintop for evidence and makes another gruesome discovery: the skeletonized remains of two adults and a child. And then, the unthinkable happens. Could Mattie become the next victim in the murderer�s deadly game? A deranged killer torments Mattie with a litany of dark secrets that call into question her very identity. As a towering blaze races across the ridge, Cole and Robo search desperately for her―but time is running out in Margaret Mizushima�s fourth spine-tingling Timber Creek K-9 mystery, BURNING RIDGE.